Hello! Hope you a having a wonderful weekend! 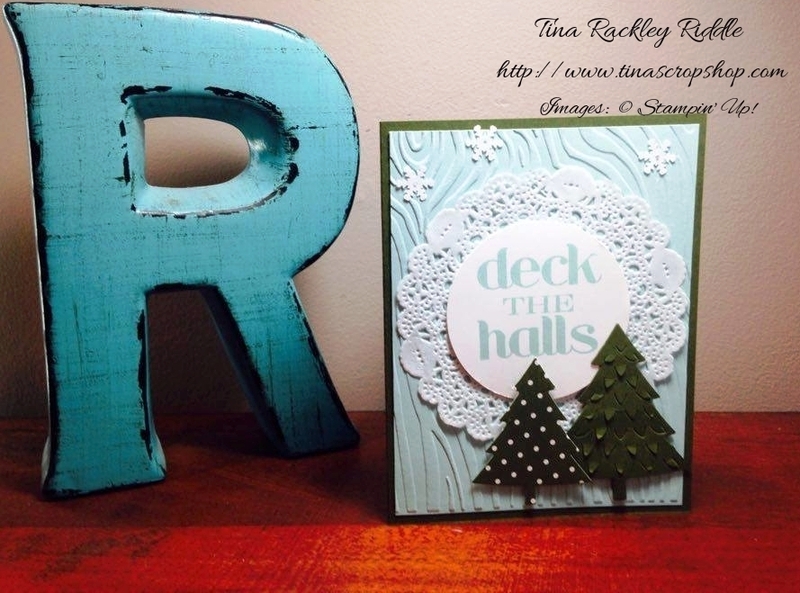 I'm sharing a card made with Perfect Pines Framelit Dies. This one came together super quickly which for mass production is always good! I started with an A2 Mossy Meadow Cardbase. I topped that with a layer of Pool Party Cardstock that had been embossed with the Woodgrain embossing folder. My sentiment from the retired set Christmas Messages was stamped in Pool Party on Whisper White cardstock and punched out with the 2 1/2" circle punch. I layered it on a tea lace doily. I cut out my Pine Trees with the Perfect Pines Framelits Dies, the small one was cut out with Mossy Meadow Background DSP and the larger one was cut out with Mossy Meadow Cardstock. Both pine trees were attached with Dimensionals. Lastly I used my fine tip glue pen to attach a few of the retired Snowflake embellishments.